This marks the start of a new era in the Sonic the Hedgehog franchise. The first game in the series to appear on a Nintendo system, and the first time in the history of the series that Amy would shake her maracas. Truly, this was the pinnacle of the franchise for many years. You have Sonic the Hedgehog and three of his numerous friends to pick from, but they're the core peeps from the good old days. Miles "Top Gun" Prower, Knuckles the Mystical Emerald Holder, and Amy the token girl. Each character has minor differences, but how welcome it is to have four playable characters who have the exact same stages. No emerald hunting or robot shooting, thank the heavens. 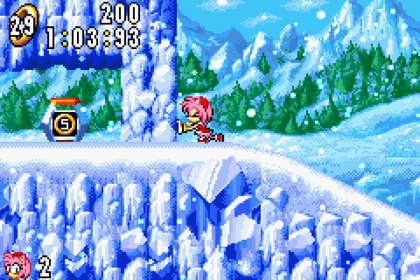 The stages follow the same Sonic the Hedgehog levels repeated ad nauseum since the beginning. Green hills, factories, casinos... Sonic games continually recycling ideas and stages, and Sonic Advance is no different. 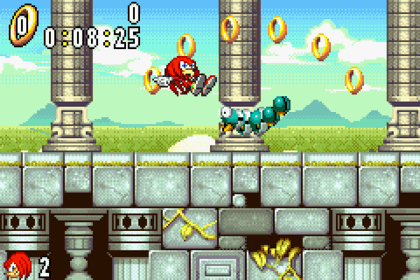 However, the game uniquely has one zone boss, fought at the end of each second act. This game simmers with colour and detail. The art style is a pleasant mix of Sonic Adventure and the more classic games, with textured background elements that give off a very professional look: for example, the detail on the metalwork in Secret Base or the cracks and chiselled designs in the rocks of Angel Island. But in a classic Dimps turn of fate, the level design itself is unforgiving. It features too many death pits, resulting in unwelcoming layouts for first time players. There is a lot of ducking and weaving above and below platforms, stage specific hazards that slow down gameplay, and cryptically hidden special stages — you can't just gather 50 rings and get to the end, no, there's ONE spring stashed away somewhere that takes you to a special stage. This game is actually a PSA about the benefits of "recycling". But I'm making it sound like this game turned the class hamster into a tapeworm, but fear not! Chao fanatics have the Tiny Chao Garden to sate their appetite. You can even deposit your Chao from the GameCube games Sonic Adventure 2 Battle or Sonic Adventure DX into Tiny Chao Garden to be pampered and leveled up on the go. There is an extensive multi-player feature that includes co-operative and competitive play. "Collect The Rings" has players scrambling through Neo Green Hill to find the elusive golden tori, "Race" allows players to jet through any normal stage, and "Chao Hunt" has players searching for chao that have been hidden within a stage. Along with the Vs. component, the game has added longevity in its Time Attack mode (which saves your best times, obviously) and the secret Final Boss, which can only be fought if you get all of the Chaos Burgers as Sonic the Hedgehog. An even deeper secret in the game is the Sonic & Tails mode, activated by a cheat code, which allows you to play as Sonic but have Tails following you, just like in Sonic the Hedgehog 2. As with all Sonic the Hedgehog games, the number of re-releases is staggering. 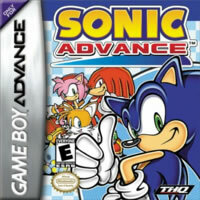 Three Game Boy Advance re-releases, a port for the failed Nokia N-GAGE (would you believe I still OWN one of those!? ), Android and Wii U in Japan, and a port for J2ME phones by Gameloft (who straight up butchered it). In my opinion, stick with the original. A good time will be had.